As your business takes on larger projects, you need a laser printer that will provide speed and accuracy with each print job. We at Pacific Office Automation are happy to offer the HP LaserJet P4015x black and white laser printer as part of a diverse series of HP office solutions. This high-speed office technology has print output speeds of up to 52 pages per minute with first copies outputting in just 8.5 seconds. Even though it speedily produces printed documents, the HP LaserJet P4015x ensures quality, printing at resolutions up to 1200 x 1200 dots per inch. With a monthly duty cycle of 225,000 pages, this machine keeps your office up-and-running without pause for much longer than its competitors. This model comes standard with 3 paper trays, but is expandable to 6 trays based on your company’s needs. Of these trays, users can maximize productivity with a 100-sheet multipurpose tray, two 500 sheet input trays, and an automatic duplexing feature. For customized projects, there’s no need to worry; this model can print on various media sizes as well as envelopes, labels, and transparencies so your office can add professionalism to your distributed materials. All print projects will be quickly sent to this system using its hi-speed USB connection, assuring that your files will all be processed in a timely manner without backup. 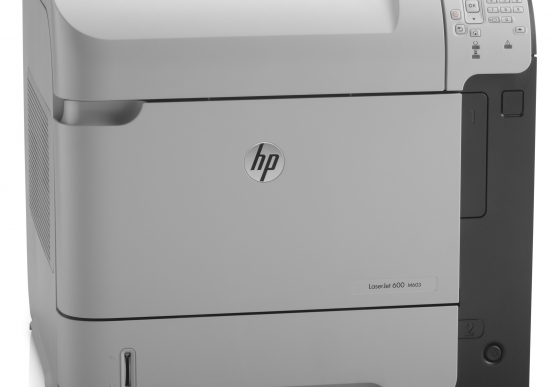 The HP LaserJet P4015x black and white printer is the best printer to improve workflow in your office while also maintaining quality that matches the grade of your business. Your busy work environment needs a laser printer that will match your fast pace—up to 52 ppm. Jobs get finished quickly with a speedy processor and Instant-on Technology, even with your whole workgroup sharing the device. Adapt to business changes easily thanks to this laser printer's expandable features—increase paper or printer cartridge capacity, print on both sides of a page, easily upgrade memory or add third-party solutions with Hi-Speed USB connectivity. Managers want independent, dependable workers—which is why IT managers will love this laser printer. Simplify management and maintenance for this device with HP Easy Printer Care Software or manage an entire fleet with HP Web Jetadmin.